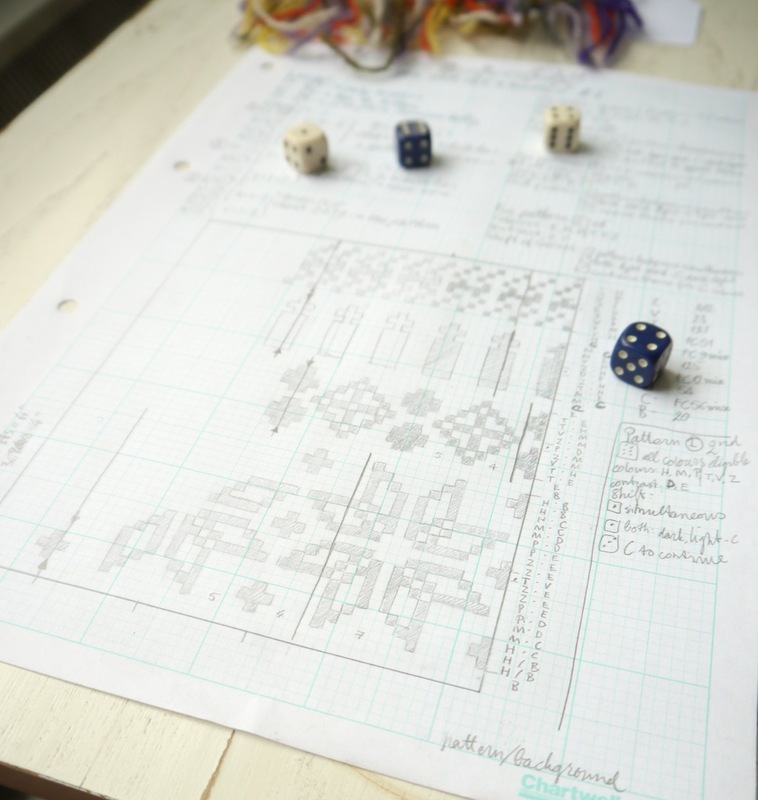 Since the start of our Aleatoric Fair Isle project, Felicity and I have had lots of fun swatching, throwing dice and posting teaser pictures on Twitter*, Instagram**, and facebook. After all the begging and pleading from our followers, we decided to reveal a swatch here and there in their full glory. Today, I would like to share some of my own thoughts on my personal experience so far; and, of course, reveal a swatch! But first let me briefly recap the concept of Aleatoric Fair Isle. Both Felicity and myself find inspiration from a variety of, sometimes, unlikely sources. So when we were exitedly chatting about both having been invited to Shetland Wool Week, John Cage popped up on our conversation. John Cage was a 20th Century composer who was inspired by everyday sounds and questioned what it means to make music. He frequently employed what are now commonly known as aleatoric processes, whereby its course is determined in general, but depends on chance in detail***. Both Felicity and I find John Cage’s ideas very inspiring and we were sure that these can be applied outside the realm of modern music. Of course, we’re not the first to be inspired by music, or using chance to create charts. 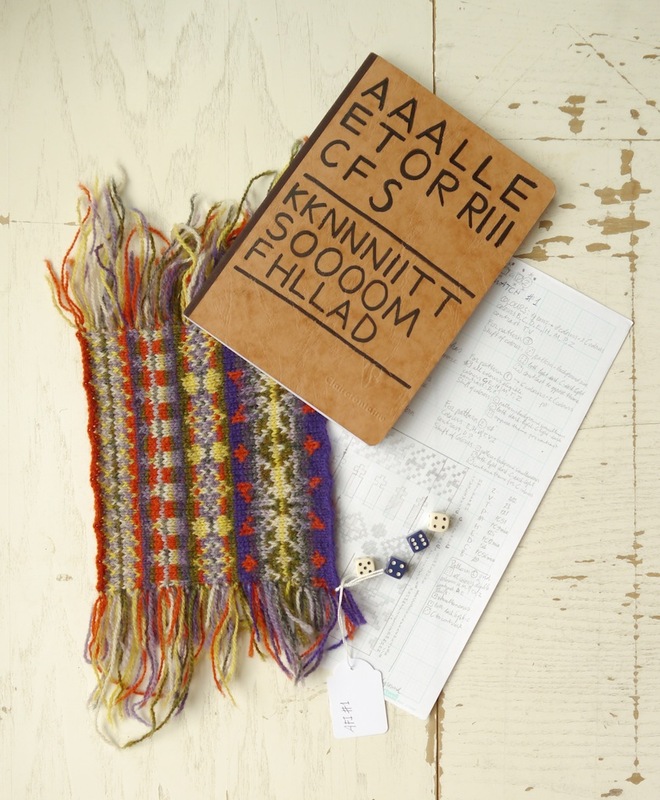 We both love the Fair Isle knitting tradition, with its myriad choice of patterns and colours. And therein lies the rub. Neither of us have grown up within this tradition, and for us to design a Fair Isle pattern means thinking really hard about these elements. So what happens if you let go of choice and deliberation, and roll the dice instead? At the start of this exciting journey Felicity and I spent hours discussing The Rules. How to determine what patterns to choose, whether they are placed horizontally or vertically, which colours to use, and how to place the colour sequences – all these things we have tried to capture in rules. We’ve made a number of grids, we have a palette of beautiful colours to choose from (kindly supplied by Jamieson and Smith,) and we have dice. For some rules we use the number as rolled, for others we look at whether it’s odd or even. It will come as no surprise that each swatch and each chart so far (I’ve knitted four swatches now,) has led to new iterations of our rules. 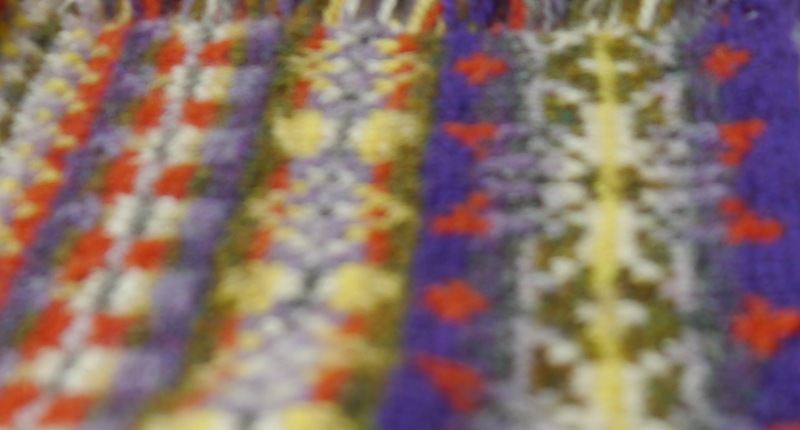 One surprising outcome for me was that although usually I find colour selection and placement the most difficult part in Fair Isle design, it was the pattern selection processes that has been most difficult to pin down. Many Fair Isle knitting books tell you that most patterns can be placed vertically as well as the somewhat more usual horizontal way, however, I seem to have a real issue with this. Each time the dice tell me I have to place the patterns vertically, I feel a reluctance to do so and I’m sorely tempted to keep rolling until I get to place them horizontally – so far I have managed to overcome my aversion, although when I finally got a horizontal placement again for swatch 5, I was almost disappointed! Clearly, not only am I learning about my own preferences, I’m also changing them through the aleatoric processes. Here is my Aleatoric Fair Isle Swatch Number 1. I hope you will enjoy following us in our journey, so keep an eye out for more teasers and the occasional unveiling of a swatch on both Felicity’s blog and mine. ***) A quote from Meyer-Eppler, read some more about Aleatoric processes and chance operations here. 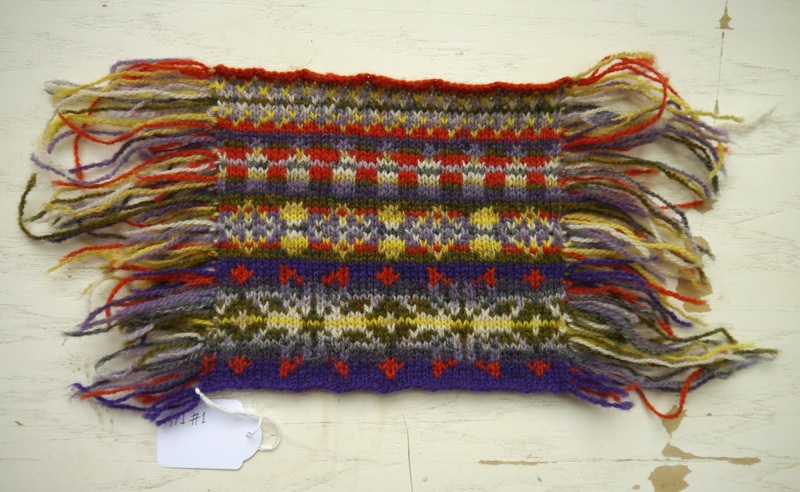 This is a beautiful piece of knitting – lots of loose ends! Knitting is usually so intensely deliberate I forget about the beauty of chance – thanks for the inspiring reminder. I wonder if other games can be introduced to yarn? Perhaps a Dada or Surrealist inspired process.. Thanks Mark. I must say I’m pleasantly surprised myself. Coming up with Da Rulez is one thing, but the proof is in the knitting! I found this post via Google. May I ask you how did you.make your Fair Isle swatch? Is this way still valid for a Fair Isle beanie? Mahalo for your time. Aloha. Found your post via Google. May I ask you how’d you knit this Fair Isle swatch? Would this still work for a FI beanie? Mahalo for your time.